Project Summary: Datsuns represent one of the Icons in the "Sports Car" world. We race several, we care and maintain many more. We have a soft spot for these Rice Burning Rockets. Here is a small sampling of the cars we have had a chance to build, race and maintain. 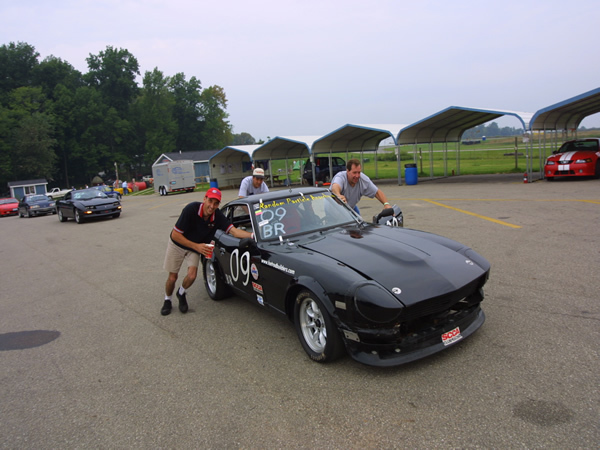 Bob and Buddies at Gingerman Raceway in South Haven, Michigan. We set the B Race Class record, again. 4th fastest of entire field (90+ cars)in the rain. Pushing the Black Beast because they will not allow you to run race engines before 8:00am. Car is currently running a 289horse L24 block, stock stroke, Rebello Racing built SCREAMER!! 3 Twin Choke Mikuni/Solex side drafts. Stock ports in a E31 head flow a little under 100cfm. This E31 head flows 200cfm. With a cam and forged 12:1 flat tops. All pull from 6200 to 7800 rpm. You can't do that in a stroker!